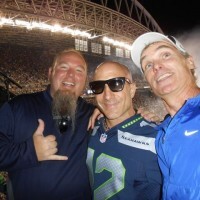 On September 15th Kenny Aronoff came to town to help the Seattle Seahawks set a new world record for the loudest stadium on the planet. 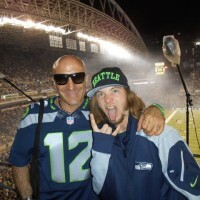 Kenny is one of the most powerful drummers ever so it made perfect sense to bring him in to help crank up the volume at Century Link Field. 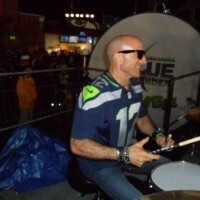 Kenny and the Seahawks Blue Thunder drum line whipped Seattle fans into a frenzy above and beyond the already insane levels they’re famous for. Kenny is a HUGE Indiana Colts fan so he literally had to “”take one for the team” by wearing a Seahawks jersey for the show. 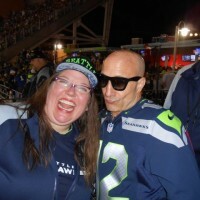 I think the fact that his beloved Colts beat the Seahawks on last Sunday helped him recover. Here’s a few pics and some video from the game. That’s me you see in the background with the cell phone camera in the “Jack and Diane” video. 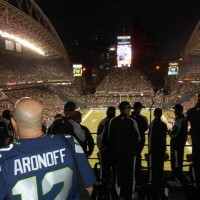 Go Hawks!! 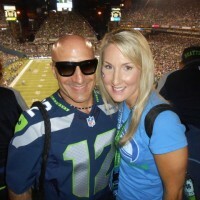 Kenny Aronoff will be back in Seattle to attempt another world record for the most drummers playing drumsets simultaneously at the WOODSTICK BIG BEAT 2013 on Sunday November 24th.